Bean thread noodles are also known as Chinese vermicelli, bean threads, bean thread noodles, crystal noodles, and glass noodles. Bean thread noodles are made from mung bean starch and water. Some are made from ground mung beans, and others are made from mung bean flour. The ground mung bean type is much better in quality than the flour ones as the mung bean flour usually affects the purity and texture of the noodles. There are many names in Chinese for bean thread noodles, such as 粉條, 粉條絲, and 冬粉. They are usually sold in markets or shops in a dry form. The most famous and the best bean thread noodles come from Longkou city in the Shandong Province in China. This is why you will often see the word “Longkou” on the packaging for bean thread noodles. Bean thread noodles can be used in many different ways and many different dishes. Examples include stir-fries, soups, cooking the bean thread noodle in a broth then draining and mixing with some sauce. You can also cook bean thread noodles in a hot pot or use them in vegetarian Chinese buns or even as a dumpling filling. You can deep fry the bean thread noodles and use as a garnish or mix with pork mince and make lion head meatballs. Bean thread noodles are an incredibly versatile ingredient. Generally, you have to soak bean thread noodles in warm water for 15 to 20 minutes before you cook them. You then drain the noodles and use according to a recipe. If you don’t soak the bean thread noodles beforehand, you will either be unable to cook the noodles evenly, or the noodles will absorb all the liquid and soup. However, another popular way to serve these noodles is to deep-fry them in hot oil. In this case, the noodles should not be soaked or blanched first. Just add them straight into the hot oil and watch them puff up. 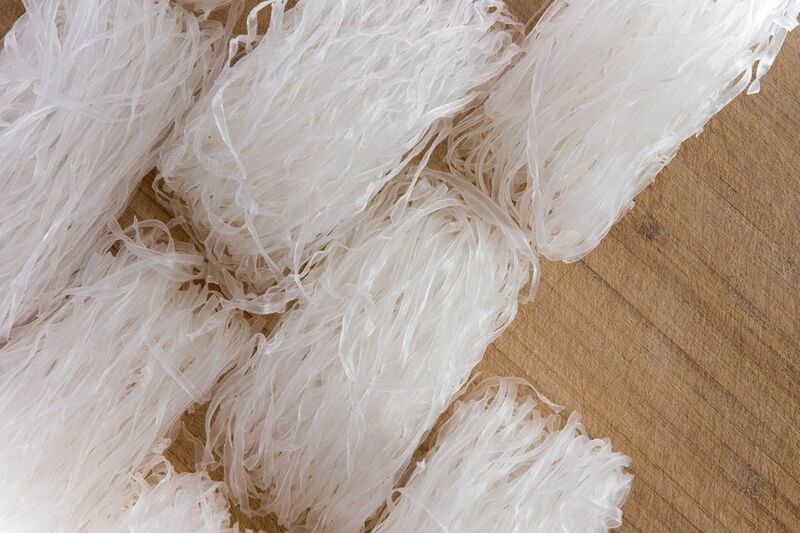 The best temperature for frying bean thread noodles is around 170 to 180 C. You can test the oil temperature by putting one small section of the noodles into the oil. If the noodles immediately float on top of the oil and the oil bubbles immediately, then the oil is at a perfect temperature. In any case, whether you’re deep-frying or stir-frying, cutting the bean thread noodle cross-wise ahead of time will make them much easier to manage. Mung beans contain high levels of multiple nutrients including manganese, potassium, magnesium, folate, copper, zinc, and various B vitamins. They can help to prevent congenital disabilities and abnormalities in the brain of the fetus. Eating bean thread noodles can help your body to maintain and repair your body’s cells. They can help with the development of the brain. Mung beans and mung bean thread noodles are a good source of calcium and phosphorus so consuming bean thread noodles can help you to have strong bones and teeth. They can also help to prevent any lifestyle-related health issues such as diabetes. As always, please consult a medical professional if you have any health issues. Remember, there are no perfect foods, so having a balanced diet is the best way to maintain your health.